Have you ever wondered, why traditional breakfasts of many world’s cultures include boiled or scrambled eggs, omelets, various stratas, fritattas or other egg dishes? Egg is a really useful food, which can provide us with a daily dose of high-quality proteins, as well as with 14 essential nutrients and 9 essential amino acids. Eating eggs on a regular basis is known as an effective way to stimulate detoxification, satisfy the hunger for longer time and lower the risks of having some chronic diseases. However, recently American scientists found out that eating 2 eggs every morning (as a part of a low-calorie diet) can substantially boost a healthy weight loss in all overweight adults. The results of this interesting study were published in the International Journal of Obesity in August 2008.
reported about experiencing higher energy levels. “People have a hard time adhering to diets and our research shows that choosing eggs for breakfast can dramatically improve the success of a weight loss plan. Apparently, the increased satiety and energy due to eggs helps people better comply with a reduced-calorie diet,” Nikhil V. Dhurandhar, Ph.D., the lead researcher of the group comments on the experiment. 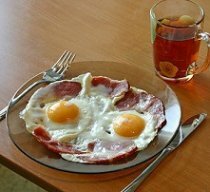 According to the conclusions of the research, eggs should be included to a weight management program as an effective nutritional supplement to enhance weight loss. However, eating eggs on a regular basis is not associated with weight loss if not supported by an energy-deficit diet. This entry was posted 10 years, 0 months ago.